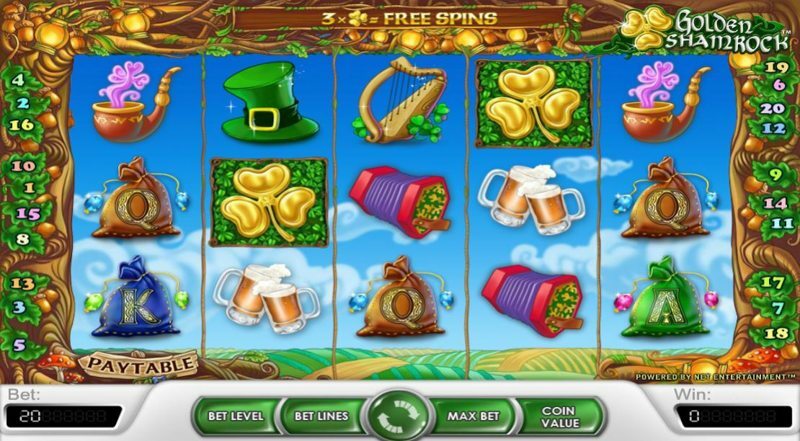 Irish-themed Video Slots are dime a dozen, and almost every software provider has created at least one slot themed around the “luck ‘o the Irish”. Thanks to classics such as Rainbow Riches (a game which achieved huge success both on, and offline), Irish-themed Video Slots are now extremally commonplace in every online casino, and while this may make it seem as though the market is saturated… as we all know, there’s always room for more high-quality Video Slots. Golden Shamrock is just that; a high-quality Video Slot, that’s Irish themed… and it’s a Net Entertainment production, so you know it’s going to be good fun, before you’ve even begun playing. 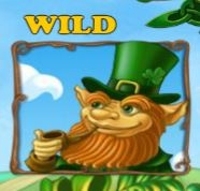 Net Entertainment decided to take the Irish Leprechaun, and place it right at the core of Golden Shamrock, and while this isn’t immediately apparent looking at the game design, once you begin playing, it becomes clear that it plays a major influence on the gameplay. The design of the game is the only thing we’re not sure about; it’s not a classic-looking Net Entertainment interface, and while the control section of the screen remains the same as every Net Entertainment slot game, the design of the game just feels a bit… crowded. Now it’s clear Net Entertainment have done this for deliberate effect – it’s just not something we see from them much. Nonetheless, the reels and backdrop are designed around rolling Irish fields, with a rich blue sky making up the majority of the background. The reels contain a mixture of low-paying playing card symbols, and high-paying game specific symbols, which includes Beer Glasses, a Pipe, a Musical Instrument, and a Pot of Gold. The wild symbol is represented by a Ginger Leprechaun, and the scatter symbols is the Golden Shamrock. Landing a Leprechaun symbol on any of the middle reels (2, 3, and 4) will turn that entire reel wild for that spin, and while this isn’t massively impressive on its own, land two or three, and you’ve got the entire middle screen wild, allowing you guaranteed 4-of-a-kind, and possible 5-of-a-kind payouts. The main attraction of Golden Shamrock is the free-spins round, of course, and this is triggered by landing three of the Golden Shamrock symbols anywhere in view in the main base-game. Once you land the three Golden Shamrock symbols, they will all light up, and your job is to simply pick one of the three symbols. This will then reveal how many free-spins you’ve won, alongside the multiplier which will apply to all your wins during the free-spins. You can re-trigger the feature, but not in the traditional way. 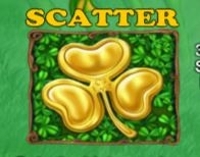 Instead of having to land 3 scatter symbols, you just need to land two of the Golden Shamrock symbols, at which point you’ll be able to pick between them, again, choosing how many free-spins you get.